The photograph last week certainly spurned on some wonderful pieces. I understand that some commentators will be visiting the Eden Project which is really good to know! Please make sure you include these 5 words in your piece plus another 100 words. If you have found yourself in this space wondering what ever this is all about do read ‘What is 100WCGU?’ . 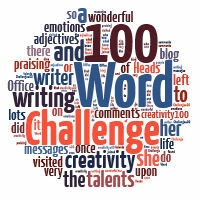 Hopefully it will tell you that the 100WCGU is a weekly creative writing challenge for people over 16! Do join in and share your words! Click here to enter your link and view this Linky Tools list. I will move all the entries to this page as soon as possible! ...but I turned it off..
…but I turned it off ..
Hmm, linky tool is offline atm. I’ll post the link here just in case, and try later. Looks like I’m skipping this week, it just won’t come to me! Pingback: 100-Word Challenge: Let it Play | Even More BonusParts! but I turned it off…. He came to me, my amazing betrothed. We came together in the soft light drifting through the bedroom window. Slowly, we melded; slowly, we explored, coming to lie on the comforter’s pillow-y cushion. He moved above me, I lost myself in response to his kiss, his touch, my eyes closed, simply sensating. I opened my eyes to seek his, looking for the gentleness of soul that affirmed my love, touching my being… …his eyes were shut, pulled into tension through passion…self-absorbed, unaware of my need for connection. I lost passion, screaming with spiritual need…but (to finish) I turned it off. You put the title in the subject box then write the piece in the main body. Then press send. I get a message telling me you have posted. I can then link the post. Have a go with the one you’ve just written & we’ll see how it goes.